I'm about to finish Long Earth and while I liked it, no characters were really as endearing as any of the discworld MCs. I'll probably wait a bit before trying the sequel. Witches Abroad is my favorite Discworld story so far. I seem to have a soft spot for Granny and Nanny. Almost done with it and then its on to Small Gods... which I'm told is really really good. It is. It's not the funniest or the most exciting, but Pratchett Talks Religion is still one of my favorite Discworld books, and a very important book in general. Incidentally, I misplaced my Monstrous Regiment, which is really terrible because the second half was absolutely perfect It was also very fortunate that I read it after The Truth (which I almost didn't) because of Otto and William's appearances. However, I'm now deep into Going Postal, and... is it me, or is the writing style noticeably different from its immediate predecessors? I'm pretty sure that's around the time Pratchett started using a writing assistant because of his condition...? I could be wrong about the specifics but he's been more or less collaborating on his books for the last handful of them. Finished Small Gods. Different, more thoughtful, than the other books so far. And I think all of them have been thoughtful! I really enjoyed it. I'm up for talking about ideas in it if anyone else is. Oh Small Gods is one of my top faves along with Hogswatch. What did you want to talk about? The tortoise as a symbol of Jesus of Nazareth or Vishnu, the idea that gods need people not vice-versa, those sort of things. I think the larger issue being presented was that institutions, be they religions, government or armies, need to remember they exist to serve, not be served. ...should be branded in flaming letters at the door of any church, temple, mosque, chapel, synagogue, or prayer room ever, to remind us all what religion, organized or otherwise, should really be about. And the brilliant part is that the second actually comes from the actual god in the story! Considering that Pratchett is, IIRC, atheist, it's absolute genius that his treatise on religion is actually a condemnation of humanity's approach to it, rather than of our belief in the divine. Nah, can't be; Going Postal was ten years ago. He wasn't diagnosed until 2007. Discworld books don't usually do chapters, though. Considering that Pratchett is, IIRC, atheist, it's absolute genius that his treatise on religion is actually a condemnation of humanity's approach to it, rather than of our belief in the divine. Anyone tucked into the new one yet? Admittedly, writing a Moist book about trains makes it seem that Terry's now writing with me specifically in mind, but I'm not willing to drop the $40 on the hardcover unless it comes very highly recommended. I'm part way through it and enjoying. Yeah, I liked it. 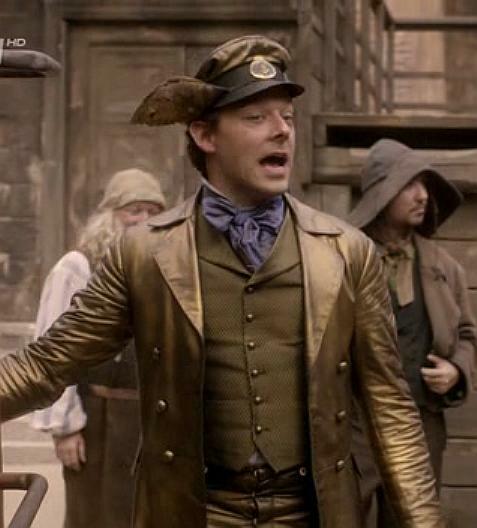 Discworld is now officially Steampunk, though, if that bothers you (it doesn't bother me). It's still a mishmash of anachronisms, but Discworld as a whole is pretty much in the Victorian era now, with outlying regions (Lancre, for example) scurrying to catch up. The last few main-series novels that have to do with modernizing industries have pushed forward the visible state of technology in the series. If you've read any of the Science of Discworld books, Unseen University is looking more like a steampunk MIT. We're only talking about Raising Steam now? I got it for Christmas, and read it then. I tend to like Moist books a lot, and I definitely liked it more then the last couple. Finished Going Postal, and it was seriously awesome. But I did find it awkward how Pratchett built up the "living mass of letters" plot, the "avatar of the gods" part, the eldritch consciousness of the Post Office and the people it killed... and then unceremoniously got rid of all those plots via arson in order to focus on the Post/Clacks rivalry. I mean, I loved the rivalry plot too, since its realistic, humanistic trappings are a better fit to "modern" Discworld and the magical bits felt like they belonged in an earlier book... And maybe the living letters were a bit too close to Pratchett's own L-Space and University Library, and he decided to scuttle the concept, but still, feels like an abandoned plot. Still deciding whether to plunge ahead to Thud! next, or pick up The Folklore of Discworld, or finally get the Tiffany Aching books. Or maybe The Science of Discworld. Yeah, the "living mass of letters" "you are the chosen one" scene is actually kind of embarrassing to read, and not even worth it in any way due to what you just said. One of my favorite parts of Going Postal was that things were getting so... mythical about a job as mundane as post-master. Yeah, the "initiation ceremony" where he became the old postmen's Chosen One was fine, especially since the golems were put through the same process. But the part where the letters literally plucked him off the ground and spun him while chanting at him, making him their mystical Chosen One, was completely unlike anything in the series since that one Octavo spell leapt into Rincewind's head. So I was intrigued to see how that enormous, unsolvable task would get resolved... (And I was also rather looking forward to seeing the golems, who could find anyone, anywhere, and don't need to sleep or rest --save for once a week-- go about distributing that mass of letters, come rain, snow, or glom of nit. ) But then it was solved by fire, and the consciousness of the letters was "fridged", for lack of a better term, simply to give Moist more motivation than he already had to take down Gilt. Even the "avatar" bit that drove Moist to take his job seriously was ultimately unnecessary to him as a character, since he antagonized Gilt more on his personal values and his relationships with other people than the "killing" of the letters or even his attempted murder. Unrelated, but I could swear that the "pipe organ that was turned into a mail sorter" with components "where pi was exactly 3" was mentioned in one of the early books as a minor gag, as one of the many instances of BS Johnson's expertise, but there are so many of these scattered across the series that damned if I could remember which book had it. I have a weak memory for fine details, but I'm pretty sure that was what set him on the path to righteousness usefulness to society. It didn't need to manifest again because there were other forces pushing him back if he strayed too far, but he would never have really gone that way without it. Finished it off on the train in this morning. I thought it was rather flat overall; Moist's scheme for avoiding the bridge issue wasn't as clever as we've come to expect out of him, and TP didn't really take advantage of being able to bounce Moist off Vimes as much as he could have. The technical / railroad stuff was all quite neat, especially the bit in Quirm. But the main plot didn't have much to it, since the coup / extremist aspect was downplayed. I could've done without explicitly making Iron Girder into a mystical object, although I suppose that could easily be interpreted as metaphor on Moist's part. So, overall good, if a little underwhelming (and certainly my least favourite of the books dating back to... I guess Monstrous Regiment?). I'm not sure what's left to use in the Moist (and William)-as-drivers-of-societal-progress line of books, though. After I finished Raising Steam I decided to revisit the older books, starting with Guards! Guards. Man did Pratchett ever have a way with words in the early books. I'm on page 12 and I'm already chuckling like an idiot. I just finished Unseen Academicals, and wow. This isn't just bad for Pratchett. It's plain bad. It might as well have been called "Discworld Callbacks: Also Some Football References". I realize Ankh-Morpork's a big place full of established characters, but trying to cram every one of them in as a cameo really bogs down the narrative. This isn't to mention the abandoned plot threads -- what happened to the Furies? -- and that Nutt is an even worse Mary Sue than late-career Esmerelda Weatherwax ever was. It's just... not punchy, certainly not like you're used to from Pratchett. One of the better callback jokes in the book is when Archchancellor Ridcully and the former Dean get into a big argument. After the situation is calmly defused, a background character notices Rincewind pulling his sock back on. Left as is, that'd be an absurd situation that draws meaning and its humor from Rincewind's previous adventures. I feel like in an earlier book, that would have been that, leaving the reader to connect the dots. Instead, there's two or three paragraphs going "Hey guys remember the end of Sourcery? It's probably the same sock lol". It comes off as clunky, inelegant, and overexplained. I'm starting to feel like I'd be better off skipping the rest of the late Discworld books. Wintersmith was the last one I think I really enjoyed. The latest DW book I've read is still Going Postal, which, as I mentioned above, felt oddly disjointed with its "avatar" plotline. As such, I think the last "funny" Discworld book I read was, by publication history, Thief of Time, or The Truth going by my reading order (though I did reread Witches Abroad last month and I was so happy with it). Night Watch was gorgeous, albeit somber, and Monstrous Regiment tried so hard to interject humorous bits in a relentlessly oppressive, gloomy story that I didn't have fun reading it until near the end. And apparently Thud! is dark and grim too? It's next on my list. Maybe Unseen Academicals is an attempt to recapture the humorous satire that first birthed Discworld, going as far as to make it a Rincewind/Wizards book? I can understand if forced comedy fails, but it it comes as a palate cleanser after a bunch of cynical books I can be more forgiving of it.